Hey guys, just want to do a quick post about this awesome pop-up shop I found today in NYC. Pop-up Shops are temporary stores opening up around the city and this one is only open for the week! 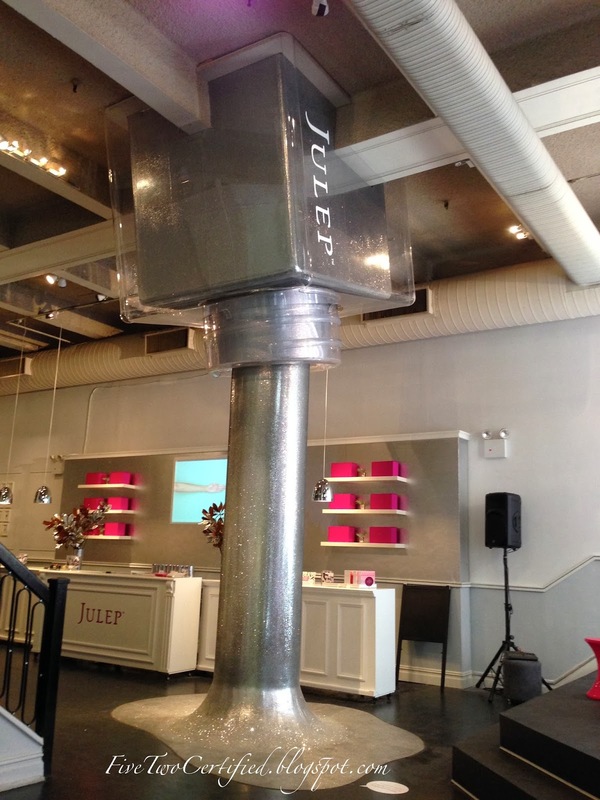 So if you are in the area, try to stop by the Julep Pop Up Shop!!! 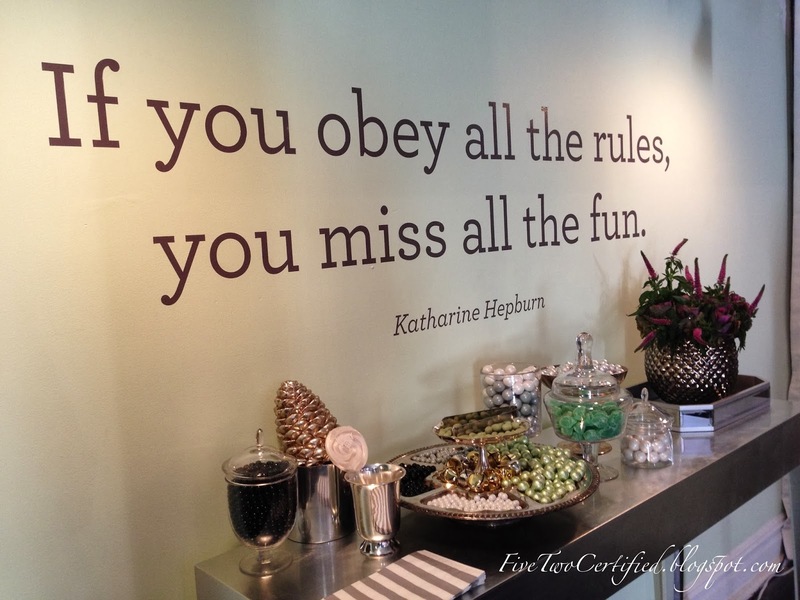 In the Pop Up store, as you walk in, a girl welcomes you to a table with a tablet to see what is your Julep Style? Boho Glam, BombShell, It Girl or the Classic with a Twist. 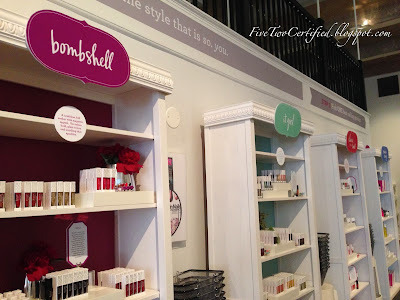 Since I have never signed up for Julep before I took the quiz and got BombShell! But before I head to explore she showed me their candy/ chocolate table which I took a couple of course! What kind of chocoholic will I be if I turned that pretty table setting with my name all over it down?!? So this huge nail polish bottle spilling (a limited edition nail polish color "Empire" specially made just for the Pop-Up Store!) all over the floor was on the other side of the store before you enter to see all their products. How cute is that?!? Their nail polishes are arranged by your Julep style. In the back of the store are their Holiday Kits (which Mavens get 20% off in-store) and also their other beauty products such as lip glosses, lip scrub, face masks, nail oils, face serums and so many more. If you are not a Maven, you can definitely sign-up in store and build a box from the products in the store and just pay $20! The girl told me you can come in every day until Dec. 22, build a Maven box and just pay $20!!! Their Julep Maven box is a beauty subscription box that can contain from 2 or 3 nail polishes and/or their other beauty products just for $20!!! But since they do have this pop-up shop just for a week, you can build as many Maven boxes as you want and pay $20 each boxes! You can definitely cancel you subscription anytime, but to get the Maven box and the 20% off Maven discount on the Holiday kits, I signed up for the box. On the other end of the store, by the store window is their nail polish station, where you can try any nail color you like! 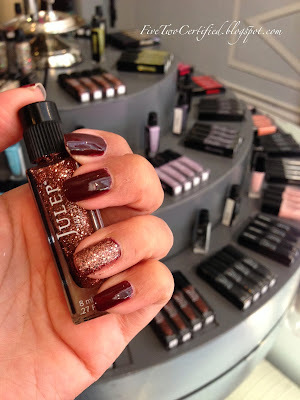 I have been eyeing the nail polish "Jane" (a nice rose gold glitter polish!) from the Bombshell shelf and so I just had to do an accent nail with it! On the rest of my nails is the Julep polish I got from my PopSugar Must Have Box which is called "Coco". If I was not in a big bubble jacket I would have taken more time playing with all those gorgeous polishes (+ I needed to be somewhere in an hour). So here's what I ended up getting for my first Julep Maven box! The other nail polish was the free nail polish color for the day. I think everyday until Dec. 22, for the first 200 customers, you get the featured nail polish of the day! This shade is "Alaina" (Classic with a Twist). So just walking in, they open at 10am everyday, you get one of their awesome polishes for free! I would definitely come here everyday, if I live nearby or work in the area but with this weather too I would rather just stay warm at home and keep my credit card in my wallet before I do anymore damage to it hehehe! 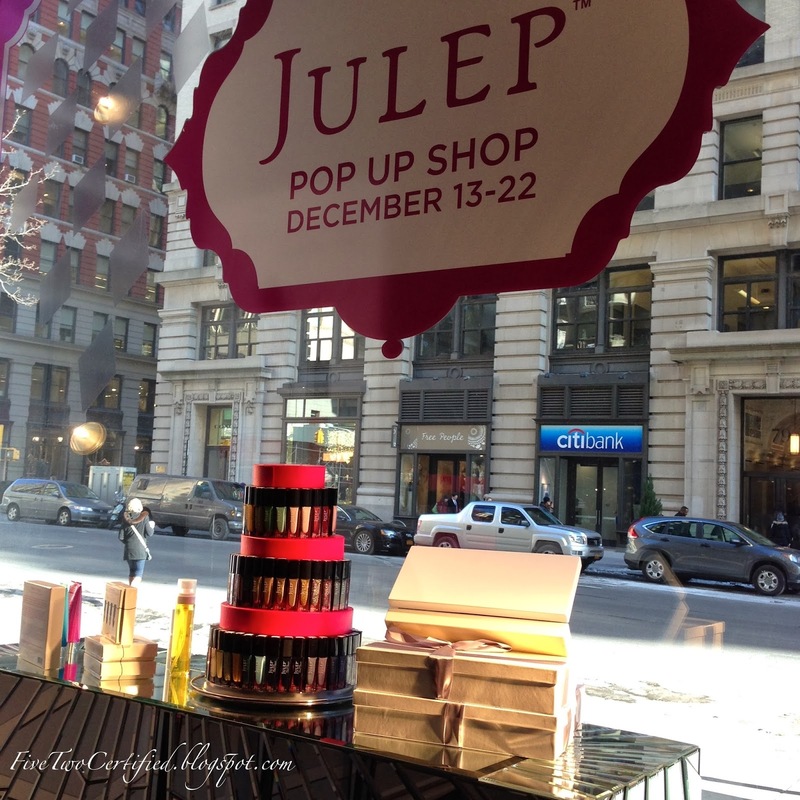 So if you are in NYC this week, don't miss out this chance and try to stop in the Julep Pop-Up Store! And then a block away is Union Square and around this time, Union Square park is full of Holiday Shops! Thank you all so much for reading! I just wanted to post this ASAP since it's only open for such a limited time! Hope you are all staying warm where you are!!! And Happy Holidays guys!! !